continue to wear the Mackenzie tartan today. 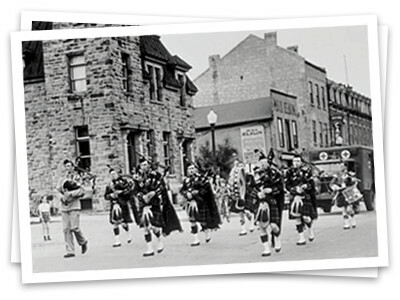 Founded in 1927, the Fergus Pipe Band has a long and proud history. In the formative years, J.W. (Jack) MacDonald served as piping instructor and acting pipe major, and J.W. Henderson Sr. was drumming instructor. In 1930, Thos. Patterson, formerly with the Guelph Pipe Band, assumed the position of pipe major. Thos. MacDonald, an experienced drummer with highland regiments and a World War I veteran, took over the duties of drumming instructor. As the band grew, funds were needed for the purchase of uniforms as the band paraded in 'civies'. Two founding members had served with the Seaforth Highlanders in the first World War and it was agreed to adopt the MacKenzie tartan that was worn by the Seaforth Highlanders. The band continues to wear the tartan today. Merchant James Russell (now James Russell & Sons Ltd.) provided the lumber and site for members of the Pipe Band to run a refreshment stand in Fergus to raise funds for uniforms. Thanks to this venture and the generosity of local citizens, funds were raised and the first uniforms were purchased. The first parade in full uniform took place in June 1931 when the band led the I.O.O.F. church parade in Fergus. For decades, the Fergus Pipe Band has enjoyed a solid reputation as a street band. The band has participated in parades both locally in Ontario and elsewhere, including parading in Maple Leaf Gardens in the 1950's; participating in Warrior's Day parades at the C.N.E. ; participating annually in Remembrance Day and Church Parades in Elora, Salem and Fergus, and playing at a number of events throughout our communities: Oktoberfest parade, 2006 World Lacrosse Championship; opening act for Great Big Sea (2005) and much more. See our list of events and performances for more details. Since 1932, the Fergus Pipe Band has been competing successfully in local competitions throughout Ontario – Hanover, Cambridge, Kincardine, Embro, Hamilton, Maxville and Fergus. When the first Highland Games in Fergus were established in 1946, the band began its long history of being the ‘hometown’ band, playing at the Tattoo, at various events throughout the weekend and competing. The support provided by the community and the Fergus Royal Canadian Legion (Branch 275) has been an important factor in accounting for the success of the band. We are particularly indebted to those who continue to participate and provide financial and moral support over the many years of the band’s growth. For example, including his years serving overseas in the Second World War, Jim MacKenzie piped in the band for 50 years! We would be honoured to be part of your special event. CLICK HERE TO CONTACT US. WE SPECIALIZE IN PERFORMING FOR THE FOLLOWING EVENTS. © Copyright 2019 Fergus Pipe Band. All Rights Reserved. Web Design and Content Management by REM Web Solutions.